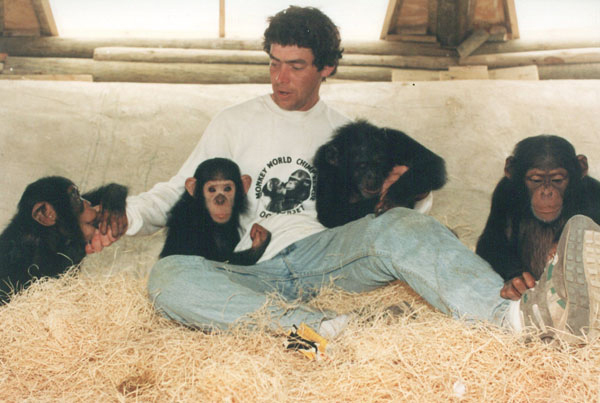 Jim Cronin, founder of Monkey World, passed away on 17 March 2007 at Cabrini Medical Center in Manhattan. Born and raised in Yonkers, New York, he was a resident of Great Britain for more than two decades where he and his wife Alison have operated their internationally renowned ape rescue centre. Monkey World works with governments around the world to halt the illegal smuggling of apes out of Africa and Asia. Jim and Alison built Monkey World from a small refuge to a 65 acre wildlife park that is home to more than 240 rescued primates of 17 different species, and it is rated as one of the most popular family destinations in England. In 2006 Jim and Alison were awarded the honour of Member of the British Empire (MBE) by Queen Elizabeth II for Services to Animal Welfare. The well-loved television series, Monkey Business and Monkey Life, have documented their frequent rescue missions, undercover investigations, and the soap opera that is the lives of the rescued monkeys and apes, for more than a decade.